Reporting on the aims of the Positive Soundscapes research project last week, news sources picked up on the apparent psychological importance of a varied and unlikely range of urban sounds, and about how we might benefit from the smart integration and manipulation of them within the built experience. Admittedly they phrased it rather more succinctly. Their examples of 'positive' sounds included "car tyres on wet, bumpy asphalt, the distant roar of a motorway flyover, the rumble of an overground train and the thud of heavy bass heard on the street outside a nightclub" as well as "baby laughing, skateboarders practising in underground car parks and orchestras tuning up." Though the preceding sentence sounds a little like Stephen Fry's description of language ("Language is ... a spluttering match held to a frosted pane, the hulk of a charred panzer, the first downy growth on the upper lip of a Mediterranean girl ..."), it's heartening to see this research going on, and with such an apparently open notion of what constitutes positive sound (and nice to see my old college, MMU, involved). And Dr. Bill Davies is quoted as saying, "Buildings and trees can be used to scatter, deaden or reflect sound, to create peaceful, quieter spaces or vibrant, exciting-sounding areas." As Geoff Manaugh speculates, this is akin to tuning the city - seeing every building in it as an instrument or performer, and thus capable of being arranged. This arrangement would perhaps have more in common with contemporary aleatoric scores than a Bach fugue, but still. So this suggests two things. First, that we could create Die Sinfonie der Großstadt, not as the musique concréte of Ruttman's work, derived from field recordings of existing urban sound, but the deliberate generation of sound in order to affect the space. 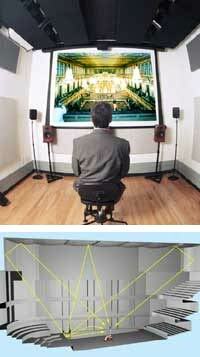 And secondly the shaping of space itself to manipulate sound to positive effect, rather than simply deaden or reduce. Modelling this is going to be fascinating. The project looks to have a decent interdisciplinary basis to the research, but I wonder if there's something beyond the lab experiments they describe, akin to how architects and engineers model light movement through cities when developing large buildings, looking at shadows cast by the structure and from surrounding buildings at different times of day, throughout the year, in different atmospheric conditions, and then folding in the flow of urban traffic - people, animals, vehicles, information - through spaces. 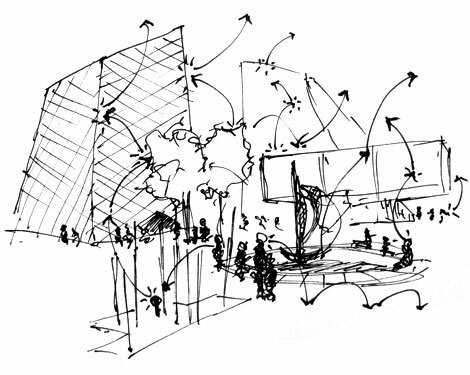 The kind of multiperspectival parametric modelling described by Paul Seletsky of Skidmore Owings Merrill at Postopolis. Could the urban soundscape be modelled in a similar way? The transmission and refection of sound waves would also vary at different points of the year, different temperatures and weather conditions ... and that urban traffic would affect it wildly. 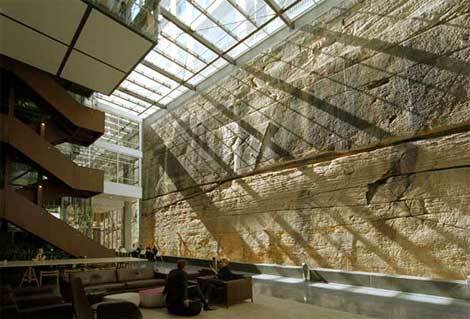 They would generally be highly diffuse reflections, amidst ever-varying open spaces. Arup's SoundLab systems in New York, London and Melbourne does this within proposed building designs - principally for performance spaces like concert halls - modelling the interior acoustic spaces and enabling them to be tuned, but I'm not sure it's ever been scaled up to look at the sound interplay between multiple buildings and across open spaces. A form of ray tracing, but of sound waves instead. I imagine this has been done within many enclosed spaces - say, within car design for instance. But to scale up this 'wave tracing' to be a tool within urban design? It would be unbelievably complex, but fascinating. Each building becomes an active participant in the shaping of the sound of the city at that point, each a player in an arrangement of noise. Assessing the impact of the building on its environment - or where architecture blurs into urban design - becomes an even more difficult yet rewarding problem. Juhani Pallasmaa's The Eyes of the Skin provides further impetus. A fabulous book on all counts, foremost amongst its many contributions is a thorough excoriation of western architecture's obsession with sight over the other senses. Of course, this neglectful focus (!) includes an endemic oversight (!) of the importance of sound within built spaces, which Pallasmaa highlights (!) throughout [That's enough visual metaphor, Ed.]. Much of the culture around architecture - practice, education, criticism, journalism - often seems largely indifferent to this most affecting of senses (with some honourable exceptions.) There are numerous texts on music/sound and architecture, certainly within the academy or associated pamphlets and books, but it rarely seems to find its way into more approachable public discourse around buildings and spaces. Sound artists and musicians have been stalking architecture for years - Steve Roden, Paul Schütze, Francisco Lopez, Jeck/Yoshihide/Tetreault, Stephen Vitiello, Peter Cuscak, Immedia, Luigi Nono, Iannis Xenakis, Bernhardt Leitner, Heiner Goebbels, James Dillon, Akio Suzuki/Rolf Julius etc. etc. - but you try to find more than a very few mentions of sound in any random sampling of the architectural press, serious or otherwise. It's actually rarely referred to outside the field of acoustic engineering, and even there it's usually a case of creating a pleasant, acoustically dead space, inert or negative soundspace. Or latent at best. There are a few other murmurs in this area, over and above this new research. The brilliant Mix-House proposal, by architect Joel Sanders, directly approaches positive sound and places it at the centre of his architecture. And when I asked Seletsky, he said SOM were working on adding sound to their panoply of parametric models. I'd be interested in hearing about any similar projects. Also at Postopolis, we heard welcome messages about the importance of multidisciplinary teams, with dedicated specialists in sound - and other things - replacing the idea of the sole 'master builder'. If this research project, and others less-heralded exploring similar terrain, really delivers, we could begin to see a revival of the importance of sound within architecture. Writing about architecture finds a whole new set of adjectives, metaphors, and clichés. Multidisciplinary teams explode in size and complexity, before retracting to find a more harmonious way of working. Education responds by restructuring courses around sensory design and multidisciplinary collaboration. The Pritzker Prize is awarded to someone for their pioneering work in acoustic space. And buildings and places begin to benefit from richer 'positive soundscapes'. As I knelt down to capture the sound - rather crudely, I'm afraid, on a Leica D-Lux 3 in movie mode - it was moving through a sequence based around these chiming electronic motifs, as you can hear. At other points it was more an altered bamboo sound, a sort of glitch-meets-shishi-odoshi movement. In Aoyama, another new Tokyo mall - Omotesando Hills, by Tadao Ando and team - also had a soundtrack composed for the space. Tokyo is of course a riot of generated sound, from the aural signatures of the individual subway stations through to the streets themselves, but this discreet music was the nearest thing I heard to deliberate shaping of sound within a space, even if the space itself will almost certainly have been shaped to reduce noise level, as Dr. Davies suggests. Both feel a little banal, ultimately, comprising a kind of generative update on muzak. 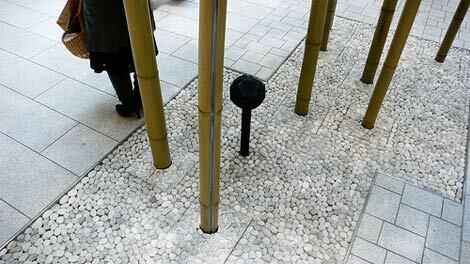 As pleasant as the 'acoustically modified bamboo' sequence was, it falls short of the varied examples suggested by the Positive Soundscapes research. Hit 'play' below to have a listen.